A traditional jazz band available for hire in Berkshire Dorset Gloucestershire Hampshire Oxfordshire Somerset Surrey	Sussex and Wiltshire England UK, to play live music for your party entertainment. 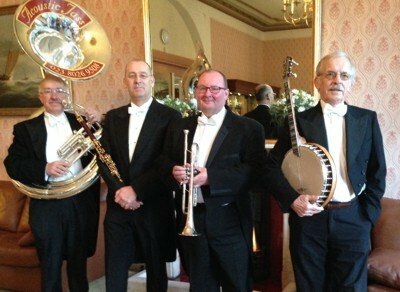 This is one of the most entertaining party bands that can be booked in southern England to play a mixture of well known jazz standards, blues, and pop songs of the early 20th century in the New Orleans jazz style, lively music that appeals to all ages. This traditional New Orleans style jazz band like all acoustic jazz bands is not dependent on electricity which allows these jazz musicians to play music for entertainment either inside or outside. Their striped blazers and straw boaters twenties look makes them one of the smartest jazz bands. To book this Jazz Band follow this link. This Jazz Band has many tunes on their playlist, mainly from the vintage swing era including well known tunes like "All of Me", "Tuxedo Junction", "Avalon", "Blueberry Hill", "Bye Bye Blackbird" and a few from the Trad revival like "The King of the Swingers". Most of their repertoire was recorded at some time by artistes like Louis Armstrong, Frank Sinatra and the Rat Pack who recorded the best tunes of the era, however Acoustic Jass is not a cover or tribute band, they play in the traditional New Orleans Style. This popular music style means that the classic jazz tunes have a beginning a middle and an end which most people like to listen to in a concert, for dancing or just as background music anywhere in Berkshire, Dorset, Oxfordshire, Somerset, Surrey, Sussex or Wiltshire. Visit their gigs done page to find out where in the south of England this traditional jazz band has performed. Like all acoustic wedding bands for hire in the south of England they can play exciting party music indoors and outdoors and can move between as required and when we have a vocalist they use a battery powered PA which is east to relocate. This jazz quartet was has performed at venues large and small in southern England and has been hired to provided music entertainment for all sizes of audiences from lunch and dinner parties of thirty people, to corporate events with up to seven hundred and fifty people (they did use PA there). This classic jazz ensemble once performed for a party of six people in their front room. Visit their gigs done page to find out where else in the south of England these experienced professional jazz musicians have played. This is the trad jazz band in "Made in Chelsea" series 8 Episode 3. Visit their gigs page so that you can see if they are available in your area on the the date you would like to book them or, to see where you can come and hear this jazz quartet. These musicians in white tie and tails at a birthday party. One of the best jazz bands in southern England live at a wedding. This jazz band playing at a birthday party.